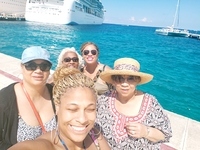 This was a first time cruise for some of my family members. There were 5 women and one of them was my grandmother who is 79 years old. We were looking for a short getaway that would provide a good time. The excitement of being able to visit Havana Cuba was the highlight of our trip. We did not purchase the excursion from the crew ship because we felt safe enough to pay a taxi driver to give us a personal tour. I will suggest doing a horse-and-buggy because it seemed a lot safer. They did have a currency exchange area as soon as we got into Havana Cuba that was helpful. I wish I understood a little better the ratio of Cuban to US dollars. We also took the beach tour in Mexico,it was totally overrated. Would not recommend the Mayan beach door. Although this was an older ship with NOT a lot of entertainment the cruise ship crew was the MOST AMAZING ever. These group of people truly made our trip so awesome and made us forget about the lack of entertainment and amenities the ship didn&apos;t have. From the AMAZING bartenders (Carlington/Damion/Courtney/Denzie/ Marvin/Clive) to DuMeing in guest services to Mihai ( the beverage manager) and Gede and Jan in the dining area they were amazing. They made this cruise one of the most memorable ever. I hope they know the positive impact they had on our group. 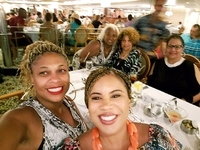 I truly hope and pray that Royal Caribbean will make them aware of how pivotal their role was to the fun the ladies from Ohio had on the ship.